Best paired with our Riesling 2017. Winter often conjures up images of hearty meals paired with powerful reds. But beautiful, crisp white wines still have their place in the cooler months! 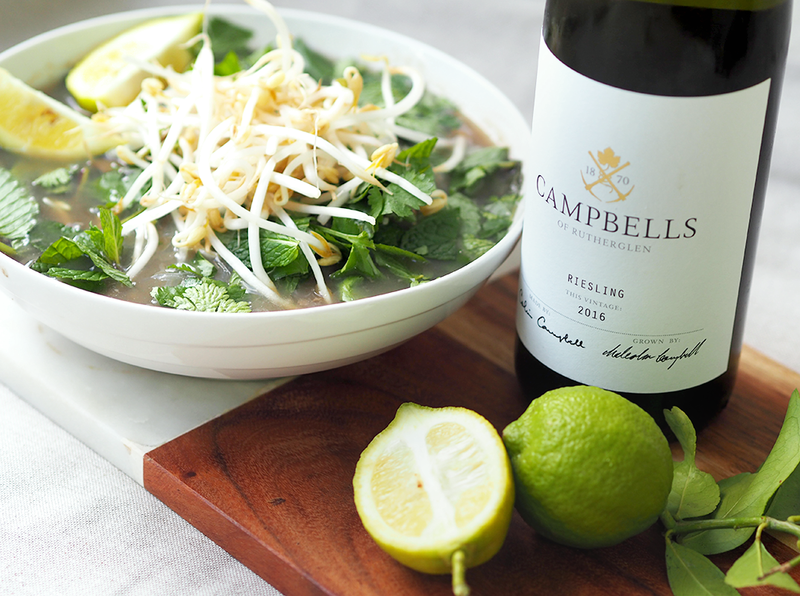 We like pairing our zesty, fresh Riesling with spicy Asian style dishes, like a warming Pho. Step 1: Place the stock in a large saucepan with the ginger, onion, garlic, star anise, cinnamon, sugar, fish sauce and 1L of water. Bring these ingredients to the boil and simmer over medium-low heat for 20 minutes. After this time, strain the liquid and discard the solid ingredients. Step 2: Meanwhile, cook the noodles according to the pack instructions and drain well. Step 3: To serve, divide the noodles among four bowls and top with the sliced beef. Ladle over the hot, spicy stock and then top with chilli, bean sprouts, basil, mint, coriander and a squeeze of lime. Pair with a glass of our Riesling 2017.